There are few things more important when we travel than an accessible bathroom. In fact, easy access to bathing facilities is probably the first thing we look for when we’re deciding where to stay. Most travellers probably don’t give bathroom facilities a second thought, but travelling with a disability or mobility problem means an accessible bathroom is a deal breaker. Imagine going on holiday and having no access to a shower or bath. How would you feel when you arrive at your hotel and realise that the accessible bathroom isn’t suitable for you. Imagine not being able to use the toilet in your hotel room – what would you do? You see, for those of us with mobility problems, the bathroom is a big deal. It’s impossible to overestimate the psychological stress of not having the right facilities available to you when you’re away from home. Many of the larger hotel chains, some cottages and even some B&B’s recognise the importance of an easy access bathroom to their guests and have gone to the trouble of installing them. 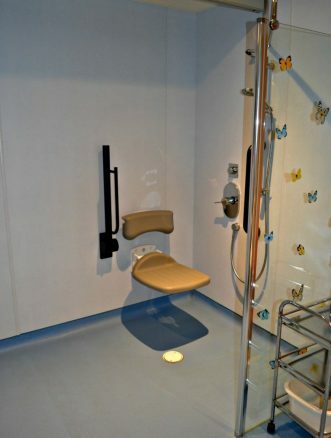 I know it’s not normal behaviour to drool over a bathroom, but I can’t tell you the number of times I’ve sat in an accessible wet room and thought “I wish we had this at home”. And I guess, that’s the point, accessible bathrooms aren’t just for hotel rooms and holiday cottages. Too many of us still have unsuitable bathrooms in our own homes. We have an adapted bathroom in our house, but it’s tiny. In theory, it’s accessible because it has a shower seat, grab rails and low-level floor. 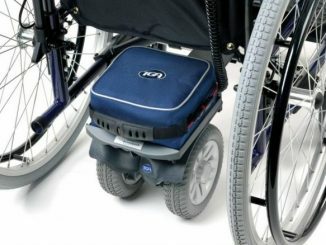 But, in reality, it isn’t accessible in a wheelchair, it’s drab, clinical and frankly difficult to use. For those of us with disabilities or fading mobility, easy access to bathing can be the difference between staying in our homes or not. Imagine having to move home simply because your bathroom is unsuitable for your needs? The good news is, today’s bathroom and wet room designers are able to create bespoke bathrooms which are not only functional and safe but also stylish. Take Premier Care in Bathing, for instance, their extensive range of walk-in baths, easy access showers and wetrooms wouldn’t look out of place in any top end hotel. More importantly, they are experts in bespoke bathing solutions and can create bathrooms to suit everyone’s needs. These walk-in baths including powered chair lifts are ideal for those of us who love a good soak but have limited mobility. 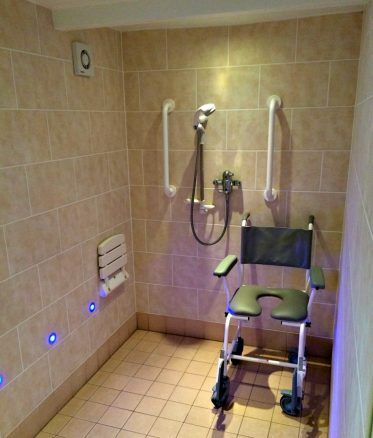 Often, a walk-in shower is the simplest solution for people with mobility problems. So there you go, my take on walk-in baths, easy access showers and wetrooms. I don’t care whether you’re travelling or at home, bathing shouldn’t be a chore or put your health at risk, it should be safe and dare I say it “a pleasurable experience”. I know many of you need more substantial adaptations, but that doesn’t mean you should settle for a clinical environment – why should you? 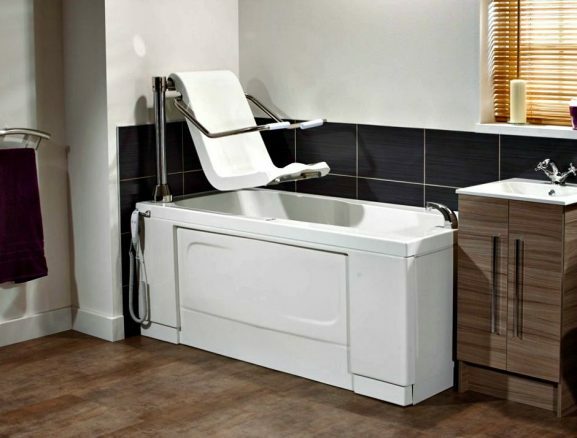 As you can see from the pictures from our travels, and on the Premier Care in Bathing website, there are many accessible solutions available to you – happy bathing! 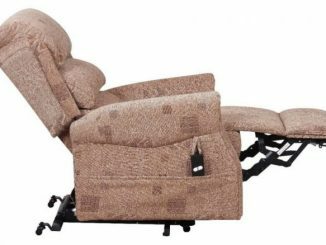 What are the Benefits of Using a Recliner Chair? 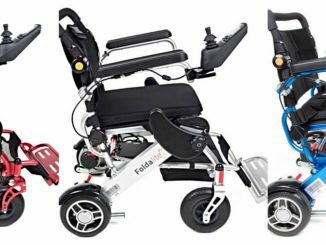 What are the Benefits of Using an Electric Wheelchair?